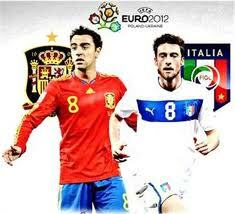 Spain vs. Italy Final Predictions Euro 2012 - Italy and Spain will fight to compete for status as the best country in Europe. Final will take place in Kiev's Olympic stadium, Sunday, July 1, 2012 (Monday local time). Both of these teams have met in Group C, the match ended with a score of 1-1 equally strong. The match against Spain at the Olympic Stadium, Kiev, Ukraine, Sunday, July 1, 2012, will be the third final for Italy. Previously they had never reached the ultimate party football tournament between nations of Europe as much as two times that in 1968 and 2000. This is the first Italian to reach the championship final game between nations of Europe. Tucked also a unique story on this show. Italy reached the final with an unusual way. They won through a coin tos after a goalless 120 minutes with the Soviet Union. At the top of the game, Italy diadang Yugoslavia. Initially, the two teams drew 1-1 in normal time and extra. Then the parties agreed they would play the replay two days later. And finally a successful Gli Azzurri's 2-0 victory through goals Luigi Riva and Pietro Anastasi. Italy's Dino Zoff was then dealt appear solid since the beginning of the tournament. They recorded a record 100 percent in the last group. In the semifinals, Italy must wait on the host at the same time Dutch champion favorite. Playing with 10 men, the team was able to force the country Pizza Frank De Boer played a round of penalty kicks. And thanks to the brilliance of Francesco Toldo under the rule, they managed to win 3-1. But Italy must bite the bullet on top of the party. Could lead through Marco Delvecchio scored in the 55th minute, their opponents, France, is able to force the game continued with an additional round after Sylvain Wiltord scored a goal just seconds before the referee blew the long whistle. Even more tragic, in that extra time, Les Bleus managed to break into Italy for the second time through David Trezeguet volley that Robert Pires grabbed the bait in 103 minutes. Immediately broke up the game because it still uses the golden goal system.